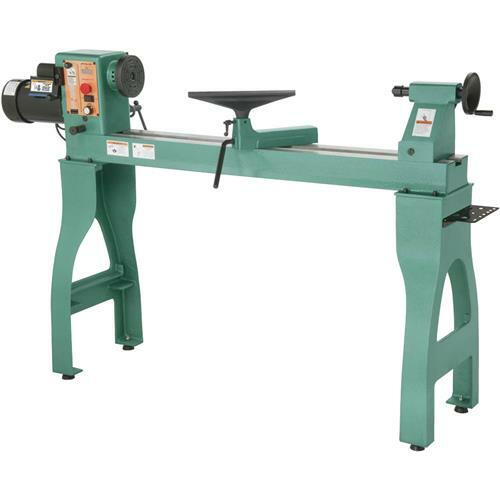 Aside from its large turning capacities, this machine has all of the features you would hope for in a Heavy-Duty Wood Lathe. For example, electronic variable speed in two speed ranges, digital speed readout, a swiveling headstock for outboard turning, indexable spindle, spindle lock pin and a forward and reverse switch for outboard bowl turning are just some of the standard features you can expect. The bed is precision-ground steel for strength and durability, and the heavy cast iron legs can be easily adapted for adding more mass. Best of all, this lathe runs on single-phase power, so it can be used in home shops as well as the workplace. The variable-frequency drive runs the 3-phase motor to provide variable-speed control and maximum torque at low speeds. 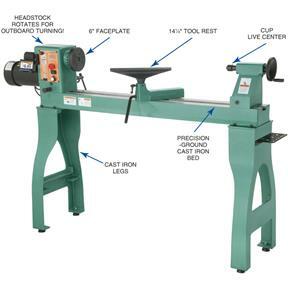 If you're looking for a lathe that will handle all of your turning needs, this is the one! Swing over tool rest base: 11-1/2"
Approximate shipping weight: 394 lbs. Nearly everything I thought it would be. Easy to assemble, great torque, and I like the swiveling head. It would be nice though if it had an off switch. You can turn the revolutions to zero, but you have to unplug it to completely turn it off. Glad to have this lathe. One of the plastic handles on a lock down bolt was broken off when it arrived. Please send a replacement part. Thank you. I am excited to use it! Would have been a 5 except for a few issues below. For $1,550.00 these issues should not be present. The holes to bolt the ways down to the legs had to be drilled out 1/32 of an inch. The bolt holding the banjo down was to long and had to be cut off 1/4 inch. The index holes had to be drilled out. Bought 2 extra rest 3" and 6" with 1" post. Major aggravation to sand down to 25mm. Can not find any rests with 25mm posts. Grizzly needs to fix this!!!! I used to have a bench-top lathe with a tubular bed, but that meant a lot of vibration when turning long items. So I figured I'd get something (thanks to my wife's generosity for my birthday) that was much heavier and not so prone to vibration. The price was right and so I pulled the trigger. It came on a truck with a liftgate (slightly extra charge) and I got it into my shop by myslf. It was "crated" in a welded steel cage and was totally undamaged (wow). I have to tell you it took three adults to lift the bed assembly to the legs. The headstock, tailstock and tool rest remained installed, as it looked like a pain to remove them, but I suppose I could have tried. Anyhow, I preplanned the electrical for my shop and had two 220 volt outlets ready to go. I wanted Hubbell connectors because they twist-lock to the outlets. So I quickly changed the plug with a Hubbell. After wiping all the packing grease off and waxing the bed, I was ready for the virgin run. Operation: The inverter operates beautifully and with the belt in the "low speed" position, I get about 1300 RPM at maximum speed. I have not switched the belt to the "high speed" position yet because my projects have all been larger diameters and required the slower speed. The emergency OFF button is great when you want to stop and restart at the same RPM. The motor soft-starts and comes back to full RPM within a few seconds. 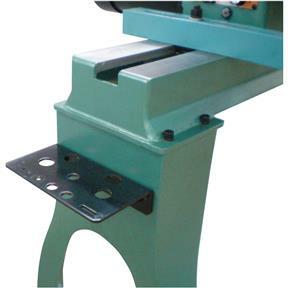 The tailstock and tool rest adjustments are smooth and secure. There is no vibration that I can see, as this unit weighs well over 300 lbs. It was a cinch to level using the threaded steel feet. I should have ordered the 5.5" jawed chuck and spindle adapter, because the faceplate and spur centers limit what I'm able to do right now. So that's my next order from Grizzly. Overall, I am quite pleased with the fit and finish of this lathe and will quickly become a woodturning addict, I'm sure. Now I'm off to the wood pile to look for another hunk of wood! I like this machine it is comparable to the more expensive models of full size lathes .Its heavy I needed help getting it together . The delivery guy put it in my garage I was at work when it arrived but my wife took care of that . It runs quietly and I look forward to making many bowls and anything else I can come up with . I bought this unit in Dec of 2017 and had to wait the three months before delivery and it's a monster of a unit. I love the fact that I can turn down to 10 RPM and really slow down the work and the reverse function is great for sanding down those end-grain projects that just don't want to sand flat in one direction. It has plenty of power and I have turned a few huge pieces that would have shaken my old lathe to pieces. With that in mind, I still can't give it a full 5 stars as there are a few nuances that bother me. First of all, the unit loves to not want to turn on at times and I have to press the on/off switch back and forth to get it to roll. I have read that the switch is an inherent flaw in these units, but it's not so much of an issue. The other gripe I have is the whine that the motor gives off at a certain speed. It sounds like a jet turbine (very cool noise at first), but I have to keep adjusting the speed to get away from that one sweet spot where the whine is so loud that I have to wear ear plugs while turning. Again, not a big deal as I now know where the whine-spot is and how to avoid it. Overall I'm very pleased with the quality of this machine and how it makes my projects all the better with all the extra features. The lathe fits my use very well. My last was the Grizzly just smaller than this one and I felt I needed a slower speed choice and reverse. It is all the lathe I will ever need, and I do a lot of turning, yet don't need a $3000 machine. My great nephew now has my old Grizzly and likes it. I have your cabinet saw and 131 1/2 " blade length anniversary band saw and I really love that, too. Very happy with my purchase. 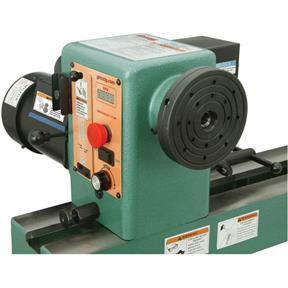 I was looking at several lathes to buy ranging in price from $1100 to $2600. After comparing benefits of each I selected the Griz. The lathe is heavy and nice to work with. All controls are convient. Excellent product. This my third major purchase of Grizzly machinery and look forward to my next purchase! This lathe is a nicely made piece of machinery. Centers line up perfectly, it has great fit and finish, just like my other Grizzly and Shop Fox machines. Sturdy, smooth, quiet. Power everywhere with the 2 HP motor. Variable speed is such a welcome upgrade from the midi lathe of another brand I was using (which required manually moving the drive belt to different pulleys to change speeds). Everything locks down solid. Two things I'm not crazy about, and they both have to do with the tool rest: the 25mm post is not a good diameter at all, and I don't like the tool rest itself so much. I'm still getting familiar with this lathe, but my tools seem to ride on the back edge of the rest which is about a quarter of an inch from the front edge of the rest. I like the point of support to be as close as possible to the wood. Personally, I like only one point of contact, but the top of this rest is a wide bevel with a front and back edge. Upgrading the tool rest, however, is next to impossible because of the 25mm post. And Grizzly apparently doesn't carry different tool rests. That minor issue aside, it's a super-beast of a lathe. I bought this lathe about a month ago, so far i have not had any trouble with it. Was easy to set up, and i am well pleased with it so far. I bought this a month ago put it together and did not run. called tech support and found out the speed control was faulty. grizzly sent a new one in a couple days I installed it and every thing is fine.Iam happy with it great customer servise. Q: What type of electrical plug comes on this lathe or do I need to supply my own? A:This machine does not come standard with a plug included. We recommend purchasing a NEMA 6-15 plug for this machine.